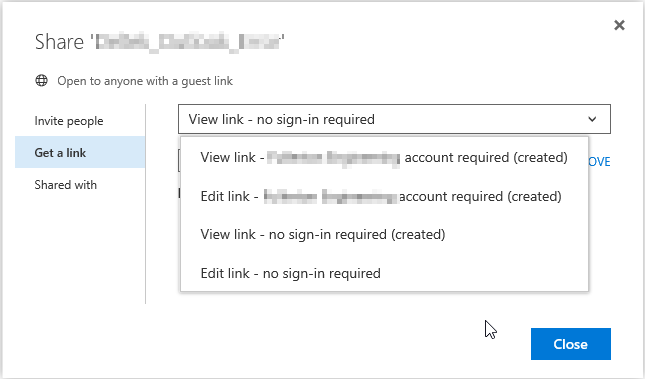 In a welcome surprise today notice that the "Get a Link, or sharing functionality within OneDrive for business has been updated. Previously there was a drop down list that was View Link, or Edit Link. If you wanted to require a Sign-In there was a check box you could enable. You can still share a link outside your organization, but must use the "Invite People" option now vice just requiring sign in. Another aspect, and this is the one that was long overdue and perfect, is the ability to have the links expire. You can now have the link "expire". Now this is good for public links, where you need to share information. That happens to be what I was doing when I noticed this. I needed to share a video of an issue with a product to the support team. In this case, I can upload the file, and give a 30 day link that I know will not be available in the future. The only thing I wish this also applied to, would be the Invite a user portion as well. There are times when you could be collaborating on a project and you want to share the file for a day or a month and it would be nice for that expire as well. Here is to hoping that's what next. Newer PostMeraki Port based Access Control Policies vs. Traffic Access Control policies.